When it comes to candy bars, everyone’s got their tried-and-true favorites that they’ll stick with forever. Not that we don’t branch out every now and again, but once you’ve found your faves, you’ve got a tendency to stick with them, right? And furthermore, if you’re already obsessed with the flavors and ingredients of said favorites, it only makes sense that you’d want to emulate the combination in other dishes! 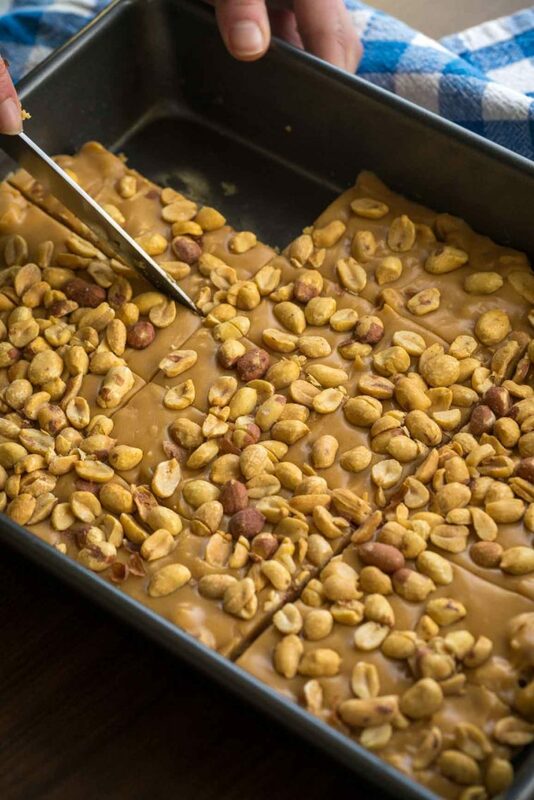 With all that in mind, we decided to make homemade Pay Day bars so that we could have a dessert on hand whenever our peanut and peanut butter cravings strike…and boy, are we glad we made these! Melt butter and peanut butter chips in a large saucepan over medium heat until smooth, then stir in condensed milk, vanilla extract and marshmallows, stirring until smooth and incorporated. Generously grease a 9×13-inch baking dish with butter or non-stick spray, or line with parchment paper, then spread half of peanuts across baking dish. Pour condensed milk mixture over peanuts, then sprinkle remaining peanuts on top. Refrigerate or let sit at room temperature until set, then cut into bars and enjoy.